The new C.E.O. Hybrid case for the iPad 2 combines a hard shell case with a soft fabric folio case and throws in a sleep/wake lid for good measure. The outside of the case is a hard shell with a rippled design. The case comes in black. 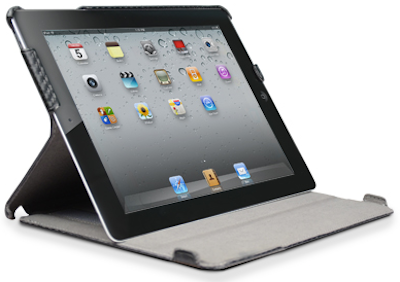 When the iPad 2 is securely fastened in the case, the lid turns the display on when opened and off when closed. Magnets secure the lid. All the appropriate buttons and ports are available and the iPad 2 can be charged without removing it from the case. The inside is an “injection molded” soft, scratch-resistant substance that looks and feels like felt. The protective lid also doubles as a stand for typing, display, etc. and includes a hand strap. The MSRP for the C.E.O. Hybrid case is US$49.99 and it is available from the web site. The fact that this is a hard shell case adds a bit to the overall weight of the iPad 2, but the benefits will outweigh that for many users. It is very sturdy and the fit of the iPad 2 in the fully closed case is very secure. To use it as a stand for either typing or viewing you just unfasten it from the bottom two grip corners and fold back the top to form a stand. There are two possible positions for the stand. In this position the user is afforded a very stable stand (landscape only) from which to work or view. 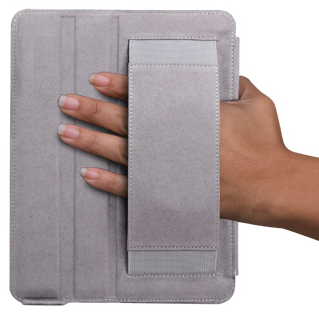 The attached hand strap can also be used with the top folded back and would be very useful for activities such as FaceTime, but while the iPad 2 does not appear to be in danger, the case does not feel particularly secure when using the hand strap. I do. I like the protection of the hard outer case and the fact that it also gives me the ability to quickly create a sturdy stand. I like the way it looks as well. It has a nice, professional look and feel. I also think the price point is quite reasonable for a case of this quality. 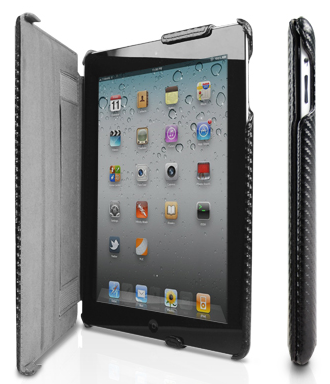 An iPad 2 case which combines a hard shell case with a soft fabric folio case and a sleep/wake lid.